CEA is committed to a ‘Full Compliance Culture’ where health, safety, and environmental matters are of the highest priority in all activities. Striving for continuous improvement, CEA follows the comprehensive Safety, Health, Environmental and Quality (SHE-Q) management system. The commitment of the management team can ensure continuous training and development of the workforce and well-being of each and every person associated with CEA. Engage only subcontractors who are proven and competent in H&S procedures. Communicating regularly with community groups and key stakeholders on environmental issues. 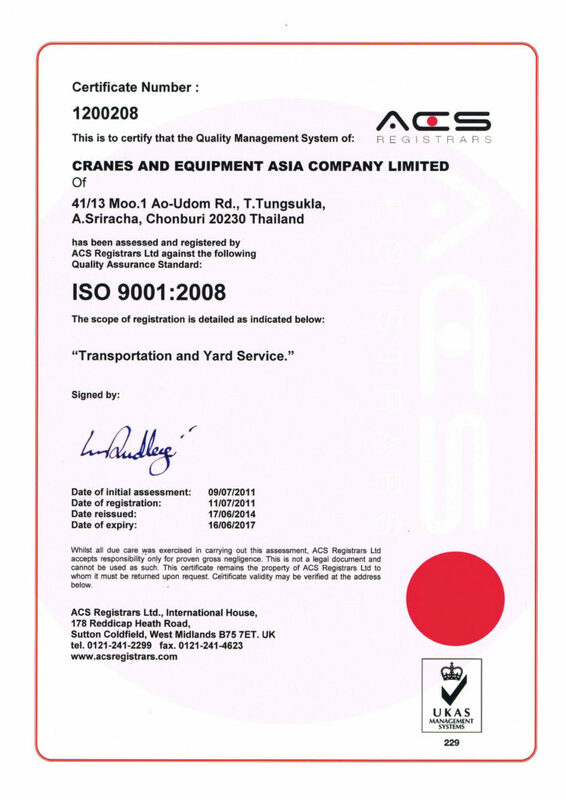 Cranes and Equipment Asia (CEA Project Logistics) have attained the Quality Assurance Standard ISO 9001:2008 by ACS Registrars a part of UKAS Management Systems.